Dean and Sam receive a case from Mick but it is Mr. Ketch using Mick’s phone and computer. He sends to check out a case in Wisconsin. People have gone missing and the sheriff seems to not really care about pursuing the cases. As they continue to investigate the case their eyewitness goes missing after talking to them. While Dean and Sam are investigating the case Ketch and a couple of other British Men of Letters break into the bunker and search it for the Colt. They also take an inventory of everything there. Ketch takes a picture of Mary and Dean even after he told the others not to misplace anything while they were taking pictures and looking through stuff. Mr. Ketch plants a bug under the table in the library before they leave. Then Dean and Sam figure out what they are dealing with. They call him Black Bill, and it’s a person with a goat head. They find out that the sheriff knew about the creature and did nothing about it, and then he tells them the story and how the creature came to be there. The creature is called Moloch. Dean is taken by what they think is the creature but is actually the sheriff’s half brother. His name is Pete. He tells Dean the story of the Bishop family. He is jealous of his brother and had found out about Moloch, and then he agrees to help Moloch and freed him. Pete started taking some of the local people as sacrifices to Moloch. Sam shoots Moloch with the Colt and saves Dean. They head back to the bunker and call Mick to fill him on how the case went. Mr. Ketch answers and tells them he’ll be their contact since Mick has went back to London for awhile. After they hang up Dean and Sam talk about Mr. Ketch and how creepy he is. They don’t know he can hear everything they are saying. It’s going to be interesting when they do find the bug under the table. 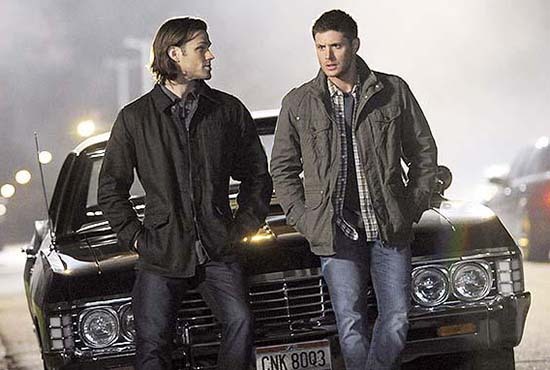 Dean and Sam start talking about their legacy and what people will remember them for. Sam tells him that the people they have saved through the years is their legacy. Then he and Dean carve their initials into the table like they had done in the Impala when they were younger. New episodes start again on April 27th. In the April 27th episode Kelly makes an interesting about the future of Lucifer’s baby.